, an eminent benefactor to the taste, elegance, and literature of his time, was the son of col. Mordaunt Cracherode, who sailed with lord Anson, and in 1753 was appointed lieut. governor of Fort St. Philip, in Minorca. His mother was Mary, the daughter of Thomas Morice, esq. paymaster of the British forces in Portugal in queen Anne’s time, and brother to William Morice, esq. who married bishop Atterbury’s daughter. The colonel died June 20, 1773, and his widow Dec. 27, 1784, at their house in Queen’s-square, Westminster, which was afterwards inhabited by their son, the subject of the present article. 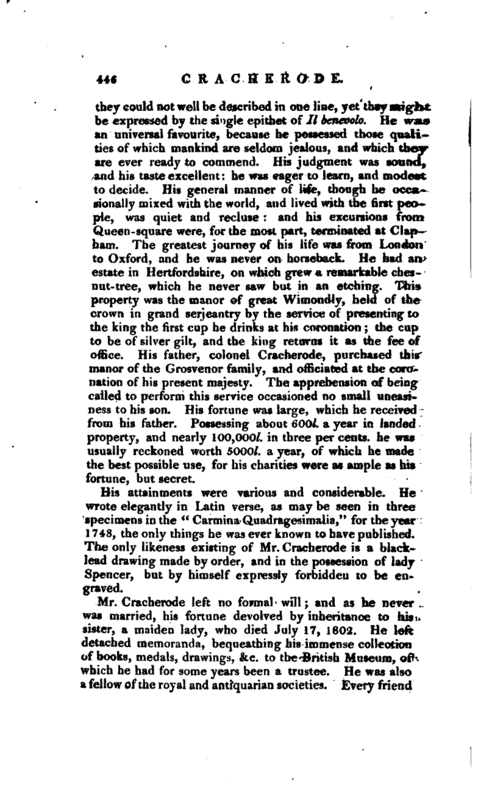 Mr. Cracherode was born in 1729, and educated at Westminster school, where his contemporary the late Mr. Cumberland says, he was “as grave, studious, and reserved as he was through life; but correct in morals and elegant in manners, not courting a promiscuous acquaintance, but pleasant to those who knew him, beloved by many, and esteemed by all.” He was admitted a scholar at Westminster in 1742, and in 1746 was elected to Christ-church, Oxford, where he took his degree of B. A. and M.A. at the usual periods: the latter, April 5, 1753. He entered into holy orders, and atone time held the curacy of Binsey, a donative, near Oxford, but accepted no preferment afterwards. At the same time, he maintained that simplicity and purity in his appearance, manners, and sentiments, which belong to the character he professed. 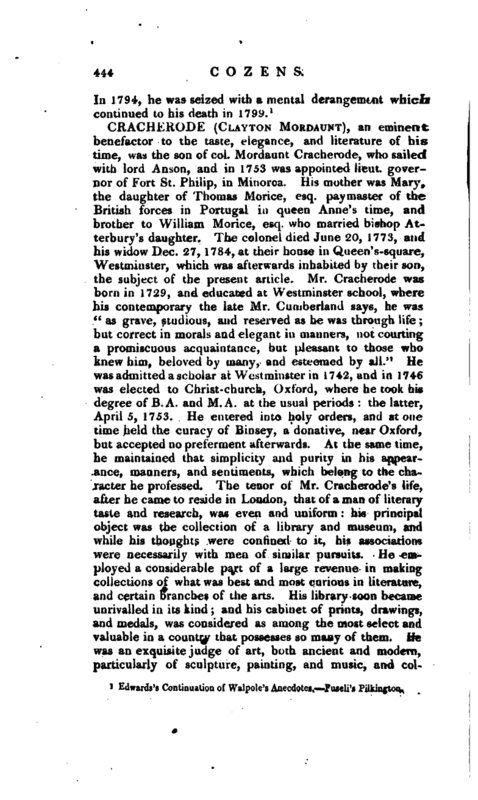 The tenor of Mr. Cracherode’s life, after he came to reside in London, that of a man of literary taste and research, was even and uniform: his principal object was the collection of a library and museum, and while his thoughts were confined to it, his associations were necessarily with men of similar pursuits. He employed a considerable part of a large revenue in making collections of what was best and most curious in literature, and certain branches of the arts. His library soon became unrivalled in its kind; and his cabinet of prints, drawings, and medals, was considered as among the most select and valuable in a country that possesses so many of them. He was an exquisite judge of art, both ancient and modern, particularly of sculpture, painting, and music, and | collected the choicest’of early printed books, drawings, coins, and gems. Many of hisarticles were unique for their beauty, their preservation, or the rarity of their occurrence: such, for instance, as his cameo of a lion on a sardonyx, and intaglio of the discobolos; his Tyndale’s New Testament on vellum, that formerly belonged to Anne Boleyn; his lord Finch, with wings on his head, by Marshal; his Olbiopolis, and his Dichalcos, the first and smallest coin, being the fourth part of an obolus. Of these, and every other curiosity in his possession, he was, at all times, most obligingly communicative. His books, which he used modestly to call a specimen collection, particularly books of the fifteenth century, form perhaps the most perfect series ever brought together by one man. His passion for collecting was strong in death, and while he was at the last extremity, his agents were buying prints for him. In his farewell visit to Payne’s shop he put an Edinburgh Terence in one pocket, and a large paper Cebes in another, and expressed an earnest desire to carry away “Triveti Annales,” and Henry Stephens’s “Pindar” in old binding, both beautiful copies, and, as he thought, finer than his own, but which Mr. Payne had destined for lord Spencer. This last visit was paid on the Monday before his death, when he seemed to depart in a manner that was visibly affecting. Soon after he got home, it was found necessary to call in sir George Baker, who paid the most unremitting attention, and revived him from the momentary effects of a fit in which he fell down, but could not protract life beyond the Friday following, April 6, 1799, when this amiable man expired. He was interred in Westminsterabbey. His death was probably brought on by a cold he caught in going out after a long confinement. It was apparently an atrophy, but at last, a constipation of the bowels. 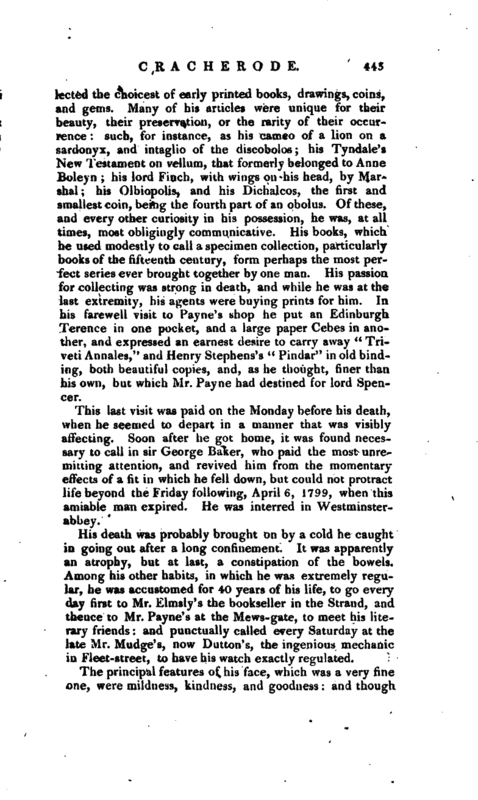 Among his other habits, in which he was extremely regular, he was accustomed for 40 years of his life, to go every day first to Mr. Elmsly’s the bookseller in the Strand, and thence to Mr. Payne’s at the Mews-gate, to meet his literary friends: and punctually called every Saturday at the late Mr. Mudge’s, now Button’s, the ingenious mechanic in Fleet-street, to have his watch exactly regulated. The principal features of his face, which was a very fine one, were mildness, kindness, and goodness and though | they could not well be described in one line, yet they might be expressed by the single epithet of // benevolo. He was an universal favourite, because he possessed those qualities of which mankind are seldom jealous, and which they are ever ready to commend. His judgment was sound, and his taste excellent: he was eager. to learn, and modest to decide. His general manner of life, though he occasionally mixed with the world, and lived with the first people, was quiet and recluse: and his excursions from Queen-square were, for the most part, terminated at Clapham. 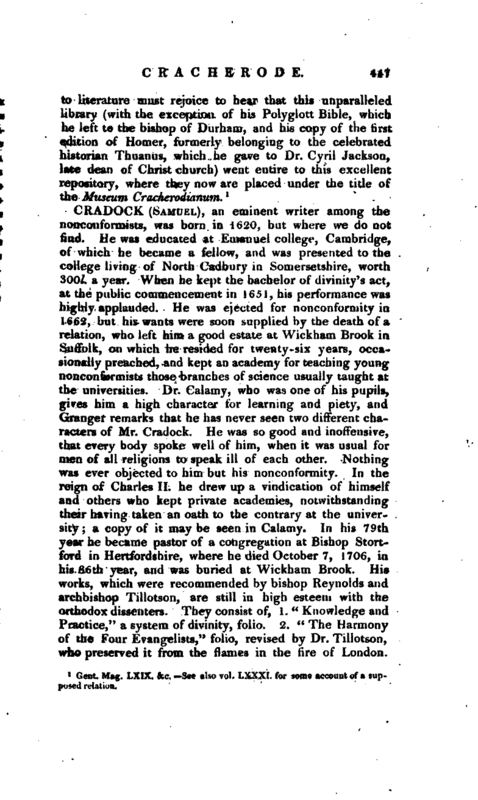 The greatest journey of his life was from London to Oxford, and he was never on horseback. He had an estate in Hertfordshire, on which grew a remarkable c-hcsnut-tree, which he never saw but in an etching. This property was the manor of great Wimondly, held of the crown in grand serjeantry by the service of presenting to the king the first cup he drinks at his coronation; the cup to be of silver gilt, and the king returns it as the fee of office. His father, colonel Cracherode, purchased this manor of the Grosvenor family, and officiated at the coronation of his present majesty. The apprehension of being called to perform this service occasioned no small uneasiness to his son. His fortune was large, which he received from his father. Possessing about 600l. a year in landed property, and nearly 100,000l. in three per cents, he was usually reckoned worth 5000l. a year, of which he made the best possible use, for his charities were as ample as his fortune, but secret. His attainments were various and considerable. He wrote elegantly in Latin verse, as may be seen in three specimens in the “Carmina Quadragesimal ia,” for the year 1748, the only things he was ever known to have published. The only likeness existing of Mr. Cracherode is a blacklead drawing made by order, and in the possession of lady Spencer, but by himself expressly forbidden to be engraved. Gent Mag. LXIX. &c. See also vol. LXXXI. for some account of a supposed relation.